This past week I finally got the chance to put together the kosher Syrah tasting that I have been craving. I have been stockpiling Syrah for some time and now we finally had the chance to try them all at the same time. I have been at all of the kosher California wineries; Herzog Cellars, Four Gates Winery, Agua Dulce Winery, Shirah Winery, Covenant Winery and the Brobdingnagian Winery, and I have caught the bug of cool weather Syrah. This is not a myth; this is a real change in the manner of which the Syrah expresses itself. The Syrah tasting consisted of a bunch of kosher California Syrah, along with one from Australia and Israel in the following order. The 2009 Harkham Aziza Shiraz, Preservative Free (not tasting as great as when I had it in Sydney), 2009 Shirah Power to the People, 2003 Four Gates Syrah, 2008 Syraph Syrah/Grenache, 2007 Brobdingnagian Syrah, and the 2004 Yarden Ortal Syrah. The first five are cool weather Syrah, while the Yarden Ortal is an example of hot weather Syrah. The 2007 Brobdingnagian was Jonathan Hajdu’s inaugural release and since than he has gone on to become the associate winemaker at Covenant Winery, while also making more of his Brob wine. The 2008 Syraph was essentially the first release by the Weiss Brothers, though they did make a smaller batch of wine in 2005 as well. The story of Jonathan and the Weiss brothers can be found in a lovely written article by Gamliel Kronemer here. In cool weather climates, the Syrah grape is very happy to show expressions of smoked meat, black pepper, tobacco, and leather around their core of blue-black fruit. They also have nice acidity, which helps to brighten the mouth and balance out the wine’s palate. The clear note here is that the grape expresses blueberry and watermelon in ways that will astound you. The bright sweet blueberry along with rich black fruit make for a wine that is unique and truly flavorful. The blue fruit may not always appear at first, but a trademark of the cooler climates, in Australian and California, was that they all exhibited rich blueberry fruit intertwined with some lovely black and sometimes watermelon along with spice. In warm climate regions, characteristic Syrah flavors tend toward dark fruits, cherry, white pepper and earthy notes, though leather and tar are sure to also make a guest appearance. For the longest time now I have been starting to feel the heat of Israel wines on the palate and I am starting to sense more of the same-old same-old overly ripe Israeli wines that have date, prune, and raisin expression. When I tasted many Israeli wines at the Herzog event, some were better at hiding the overly new-world expressions from their wines, while others were very poor at it. This has been a theme in Israeli wines for sometime and one that Israel is working on breaking. A great example of an Israeli Syrah that is not overly new-world, would be the 2009 Recanati Syrah (with 3% Viognier), it is full-bodied and lively in the mouth, without the need to pump up the fruit until it’s ripeness dominates the palate. Still, Many are happy to crown Yarden with its Ortal and Yonatan Syrah as one of the best in Israel, as the late Daniel Rogov did. Personally, I find the over ripe fruit a hindrance to the acceptance of these wines and maybe a reason for why the Wine Advocate has yet to give many 90 point scores to the Yarden wines. Another beautiful example of Shiraz or Syrah (more on that in a moment) done correctly would be the 2009 Bravdo Shiraz, though you smell the ripeness of the fruit, the date and raisin notes do not dominate nor overly express themselves on the palate or finish. When tasting the California Syrah wines, it was unbelievable how ripe the fruit is while not being hot or warm climate fruit. The difference is insanely clear and was an eye opening experience for all the wine lovers on the table, when they could taste the wines side-by-side and see the difference between sweet and ripe vs. overly hot and ripe. The ripeness in the cool weather vineyards comes across as real sweetness and vibrancy that you would find in blueberry fruit and candy. The overly ripe and hot flavors came across as date and prune without any of the warm sweetness. Before someone asks; California is hot right? Sure it is, but the vineyards that these wines come from are fog and ocean cooled, and work very hard to get to full ripeness. It is this extra effort, and the long gestation period to get there, that makes for sweet but not hot wines. Of course this could very well be a gross exaggeration, as my sample size, for kosher California and cool weather Syrah, is still rather small. That said, there are many websites discussing this very matter and one that I heard from Gabe Weiss, the winemaker for Shirah and Syraph wines. Finally, we get to the whole Shiraz, Syrah, and Petite Sirah discussion. On this I will just punt and pass you to my previous posting on this subject, where the discussion is given far more love than I could do today in this space. Sill, while on the subject, the discussion of the cold weather versus hot weather dichotomy, may well be another reason for why people are buying less of this glorious varietal. Now, people may say that Cabernet has varied expressions of itself as well? Sure, along with Merlot, but not to the variation that Syrah does. One does not expect to pick up a bottle and get black and hardy wine in one bottle and then turn around and get blueberry and floral wine in another bottle. It is very different to say that one Cabernet has a bolder or blacker expression than another, but going from black to blue or black to floral is quite another story. For the longest time I did not like Australian Shiraz because of the cloying floral notes that can overwhelm the wines. Rather I kept my Syrah/Shiraz interests to America, Israel, and France. Once I found the Aziza wine, I changed my opinion about Australian Shiraz, but not to the tune of stocking up on them. In the end, the clear winners were the California bottles, for myself, and the rest of the table. I did not serve the Yarden Yonatan Syrah, but when I host my next Syrah extravaganza, I will make it a bit more of an even competition, with more old-world Syrah wines from Israel, along with a couple of new-world styled wines as well. Then we will once again have the opportunity to find out which style we like more. So, with my wine dream team set – I needed to come up with a lovely meal to work with them. So, I fell back to one of my serious food passions – meatballs. We also had a vegan coming over so I was in need of making some entree for her. Finally, I wanted to make some lamb meatballs, so I made three types of meatballs. During the meal, we spoke about the vegan dish and it was lovingly given the name Jimmi Slider (as they were not perfectly round as well). The other two meatballs were just implementations of the same meatballs that I have done in past weekends. Squeeze the roasted eggplants and try to get as much liquid as possible out of them. Then heat up the oil in a large frying pan and then sauté the diced onions. Once the onions are nicely browned, add in the roasted eggplants and cook the mixture until the mixture is heated through and through. Next remove the mixture from the pan and store it in a bowl and wait for the mixture to cool down completely! This is not an optional step – the mixture does not thicken until it cools down. Now the mixture should be thick. If the mixture is not thick enough, then you can add in some of the cooked rice. Once the mixture is thick enough to allow for a spoon to stand still (when stuck into it), then we are ready for the last step. Preheat the oven to roast/bake at 400 degrees. Then get a glass or earthenware roasting pan and spray it with olive oil and then place it in the oven for 5 to ten minutes. Now, with the oven hot and the pan hot – CAREFULLY remove the HOT pan from the oven and place it on a trivet and then we are ready for the final step. Next, roll the mixture in your hand and then slowly roll it in the panko crumbs (either in a bowl or plate), and place them one by one into the hot pan. Once you have rolled all the sliders, CAREFULLY take the HOT pan and return it to the oven for 40 or so minutes, until the outside of the sliders are crispy. This wine used to be a pure powerhouse, with heavy tannin and a huge body. Now this wine is a wine that should be opened NOW and consumed immediately. In other words the wine has hit the proverbial wall, and is short in its life. The nose starts off with very deep sweet cedar, vanilla, tobacco, chocolate, and licorice. The mouth starts with bright acidity, but slowly gives to nice raspberry, blackberry, black plum, and cassis. If blind folded I would have guessed it was a Cabernet. The mouth is full and soft with still existing and well-integrated tannins. The finish is lovely with more of all of the above. The wine fades away totally and you are left with just a full and mouth coating wine with sweet cedar and acidity. For the entire story on Harkham Winery and this wine, check out my posting, and the original notes that I had on this wine. This wine is NOT imported to the US. Currently, the only wine from this winery that is imported to the US is the 2009 Harkham Shiraz (Mevushal) that is brought in by Royal. Quickly enough, this is a special reserve from the Harkham Winery that has minimal addition of sulfites and as such can use the term, preservative free on the label in Australia. The Aziza’s Shiraz is named after Richard Harkham’s (the wine maker) grandmother who passes away in early 2009. This electric purple colored wine continues its dual life existence, which starts off closed with animal notes, dark fruit, currant, gravel, and loamy dirt. As it opens the wine shifts drastically to a black and blue wonder with crazy violet and rose notes, with heavy blueberry, licorice, and dirt. The mouth on this medium bodied wine is soft, plush, and mouth coating with nicely integrating tannin, concentrated notes of dark and blue fruit, oak, and a mouth that is coming together nicely. Though little sulfite was added to this wine it has no problem living for another year or two. The finish is long and spicy with animal notes, spice, leather, black pepper, oak, and tobacco that linger long. This is the 2009 edition of the Weiss brother’s micro boutique winery production. Each year, since 2008, the Weiss brothers have produced wine that was generally available to the public. This is the inaugural release for their officially named winery – Shirah (now we can stop using the term Weiss brothers). It is a blend of McGinley Vineyard grapes and Thompson Vineyard grapes, both in Santa Barbara County and both cool weather vineyards. The wine is a blend of the two vineyard’s Syrah grapes and 2% Viognier grape. The nose on this electric purple colored wine starts off with a unique attack of peach, apricot, and lovely violets and other floral hints. These stemming from the 2% Viognier, making one wonder how 2% of any fruit can impact a wine so. It will be great to see how these aromas and flavors show in years to come. As the wine opens more, the peach and apricot leave and the floral notes stand in their stead, both from the Viognier and from the Syrah. The wines from Shirah and the Weiss brothers never cease to amaze me with their sweet and ripe fruit that is also NOT overripe, hot, or overly new-world in style. The nose on this purple colored wine starts with the unique Viognier nose and then moves on to redolent notes of blueberry, black cherry, and blackberry. The mouth on this is rich, layered, and inky with pure and focused fruit, cedar backing, and lovely spice that highlights the wine and comes together with mouth coating integrated tannins. The finish is long and spicy with animal notes, graphite, tobacco, and leather all coming together with blueberry, watermelon, and cinnamon lingering nicely. This is another masterpiece and the original beast that first brought the deserving acclaim to the Weiss brothers. This is an older and bigger brother to the Power to the People in more ways than one, it is fleshier than its younger sibling, and it feels more muscled while also being supple at the same time. The fruit for this wine came from another cool weather vineyard – the Laetita Vineyard on the California Coast, and is a blend of 85% Syrah and 15% Grenache. The wine went through 45 days of maceration, allowing for more extraction of color and tannin, which gives the wine its heavy and coating mouth-feel. The nose explodes with ripe and luscious blueberry, blackberry, plum, light cedar, chocolate, and fig. The mouth is full bodied, rich, concentrated, and mouth filling with sweet focused fruit, nice extraction, cedar, herbs, spice, that comes together into a lovely mouthfeel. The finish is long and spicy with chocolate goodness, a big fat stogie, animal notes, mounds of black pepper, cloves, all spice, and leather. This wine shamelessly wraps smoked meat, black pepper, tobacco, spice, chocolate, and leather around a core of sweet and ripe blue-black fruit. 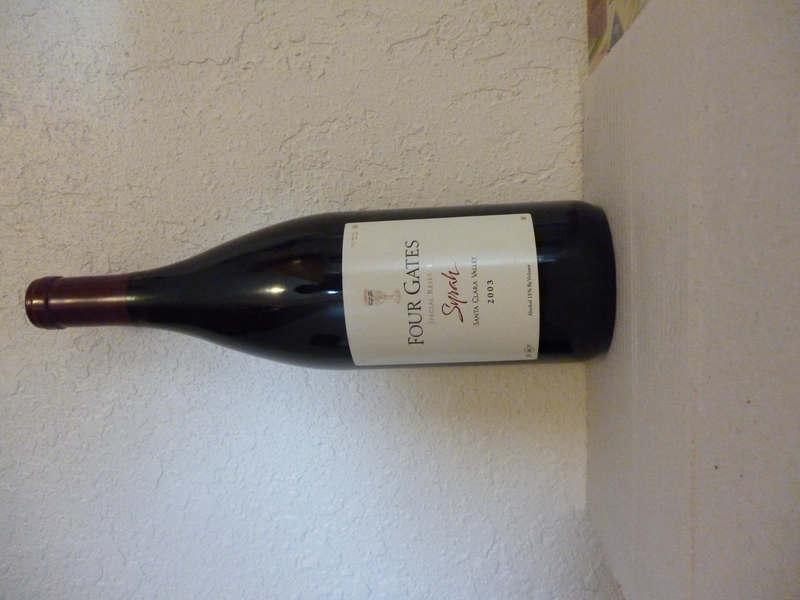 This was the first Syrah that Four Gates Winery has ever released, and maybe the best one so far. The wine is clearly ready to drink but it still has some sea legs underneath it. The wine starts off as black as the night with lovely blackberry, blackcurrant, black plum, and as time passes the wine explodes with blueberry and sweet cedar. The mouth on this full bodied and rich wine starts off with concentrated black and blue fruit, loamy dirt, and oak extraction, that is now coming together into a lovely mouth coating and round wine. The finish is long and balanced with baker’s chocolate, and tobacco, on a bed of ripe black and blue fruit. The fruit is not as sweet as the Weiss and Brob wines, but rather the wine is more Rhone in style with mineral, oak extraction, leather, herb, black pepper, and baker’s spices. The first thing you sense when holding the bottle of brob is that the glass is extremely heavy and that it is in a Bordeaux shape. Everything about this wine is unapologetic and clearly Brobdingnagian in nature, hence the name and the elephant on the label. This was the first release by the Brobdingnagian micro boutique winery and it was a massive hit. The wine says it is 16% alcohol, but that is not felt in the wine. Rather the wine feels like a monster that is proud of its extreme prowess but one that does not hit you over the head with its sheer power. Rather it is a wine that grabs you and keeps your attention while it reminds you of its mass – quite a unique wine. In a way this is not a wine for polite company, unless they are wine freaks like us! The wine is brooding in the nose with a lovely mixture of blackberry, cassis, blueberry, herb, and spice. The mouth is massive and Schwarzenegger muscled with nice and concentrated black and blue fruit, huge tannin, along with obvious but constrained oak influence, that is highlighted by spice, and one that has yet to hit its high step yet. The finish is long, spicy, and black with a focus from tobacco, leather, black pepper, spicy wood, and cloves. While enjoying this wine around the table, I loved the comments of a few of my guests; “this is a great wine because it is a big, bad, and bold and it is proud of it! It is a big wine and it is not attempting to apologize for it as it obvious from the packaging, name, and bottling – Kudos Jonathan! The wine is a new-world wines with non discreet usage of mostly new French oak for 18 months, showing as sweet cedar, along with a fair amount of overripe and hot fruit. The nose starts with blackberry, dark cherry, raspberry, date, crushed herb, high alcohol, and licorice. The mouth on this massive and brooding wine starts with an attack of sweet cedar, followed by layers of concentrated black fruit, loamy dirt, herbs, and mouth coating tannins that are just now starting to integrate. The finish is long and spicy with leather, black pepper, chocolate, tobacco, along with hints of tar, vanilla, more date, and sweet cedar. This wine has another 4 to 5 years ahead of it, but the wine is drinking nicely now. Posted on February 29, 2012, in Food and drink, Israeli Wine, Kosher Red Wine, Kosher Wine, Wine, Wine Tasting and tagged Aziza's, Brobdingnagian, Four Gates Winery, Grenache - Syrah, Harkham Winery, Merlot, Ortal Vineyard, Power To The People, Preservative Free, recipe, Shirah Winery, Shiraz, Special Reserve, Syrah, Syraph, Yarden Winery. Bookmark the permalink. 14 Comments.